Demolition Drain-Pipe is the seventeenth level of Donkey Kong Country 3: Dixie Kong's Double Trouble! and the second level of Mekanos. 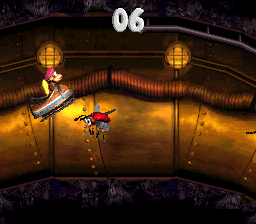 This level takes place inside of a pipeline, in which Dixie and Kiddy Kong utilize a Toboggan for the first time. The vehicle moves rapidly, and the Kongs have little control over it. Because of this, they can easily crash into small gaps or hit the pipe vents scattered on the track. The Toboggan can cling onto the railings suspended from the ceiling, where some Bear Coins and Bananas are hidden at. Demolition Drain-Pipe only has two types of aerial enemies, Buzzes and Knik-Knaks, who can both be defeated with the toboggan. 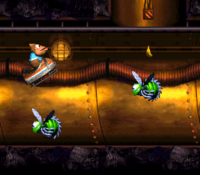 Kiddy jumps above a Buzz; the adjacent one has a Banana above it, indicating the first hidden Bonus Barrel. When the level begins, the Kongs face left toward a small gap. They can jump down it to land into an Auto-Fire Barrel, which blasts them into a Toboggan. This vehicle takes the monkeys through the Buzz-infested pipeline. The toboggan will ride along the curvy pathway, leading them to a railing with the letter K. The vehicle will continue to move as they grab the item, making the Kongs jump over more Buzzes and other obstacles. Eventually, the heroes will meet the level's first Knik-Knak, who will help them reach a high railing with a DK Barrel if jumped on. However, the monkeys will have to let go of the railing quickly, as a Buzz lurks near the DK Barrel. Continuing through the level, the apes will jump over a few more obstacles, and also grab the letter O under a Buzz. Just a little bit farther from there, they will come up to the Star Barrel. About halfway into the level, the heroes will ride into another DK Barrel and find themselves riding towards several pairs of Buzzes. They will have to jump between each group to progress. They will also find a few gaps in the area, which they should jump over at all costs. After jumping over two more small gaps, they will find a railing to grab onto with the letter N, along with some bananas. Crossing another set of gaps, they will find themselves dodging even more Buzzes and a few Knik-Knaks. As they near the end of the level, the heroes will find two Knik-Knaks in their way. They will have to jump between the enemies while watching out for a few gaps around the area. In this area, Kiddy and Dixie can also find the letter G on the above railing. Heading on, the monkeys will meet a few more Buzzes to jump over until they notice an Auto Fire Barrel at the end of the track. If they jump into this barrel, they will be shot upwards next to a flagpole. Once they raise the flag on the pole, the level will end. Shortly before the letter O, the Kongs encounter a group of four Buzzes, and the last one has a Banana above its head. 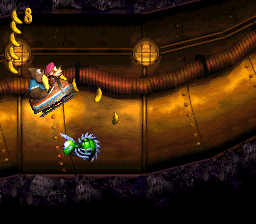 The Kongs must jump to that Banana to enter a hidden Bonus Barrel. In this challenge, the Kongs continue to drive in the Toboggan, and their objective is to jump it on six Knik-Knaks within ten seconds. A Bonus Coin spawns at the end after they defeat every enemy. Shortly after the letter N, the Kongs find a Knik-Knak in between two drain openings. The second Bonus Barrel is hidden in the second gap, which is also marked with a lone Banana. The barrel was later made visible in the Game Boy Advance remake. In the Bonus Level, the Kongs are sent directly up to a long railing. Their goal is to collect every star while they go down the railing. There are two Buzzes, each with a star over them. The Kongs must drop from the railing to collect each star. The final trail of stars is on the ground, with the final star just left of the Bonus Coin's spawn point. On a rail that the Kongs can reach by jumping on the first Knik-Knak. Underneath a Buzz, who is centered between two vents. Located below the first railing after the Star Barrel, right next to the opening below. Shortly after two Knik-Knaks, the Kongs can find the letter G on a platform between two openings. They must jump over the vent to receive it. At the end of the level, the Kongs can find a Steel Keg left of the Level Flag. The Koin is located on a small corner to the left. The Kongs must throw the Steel Keg at a wall behind it, which defeats the Koin, who relinquishes its DK Coin. Artwork of the Kongs driving through Demolition Drain-Pipe. 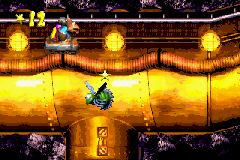 The artwork features a Krimp, but none are featured in the level. A Bear Coin is located below the Kongs. Kiddy holds a Steel Keg to the area's Koin. The Kongs jump at a railing above a Buzz. If the Kongs fail to jump into the Barrel Cannon at the end of the level, they'll lose a life when the toboggan hits this wall, though in the SNES version only, this'll cause both Kongs to be simultaneously thrown off and cry if the player has both of them. In the GBA version, hitting the wall will cause the lead Kong to be lost, followed by the other. This page was last edited on April 10, 2019, at 13:29.